National home price appreciation continued in September, while local home prices grew at different rates. All of the 20 metro areas had positive annual growth rates. The Case-Shiller U.S. National Home Price Index, reported by S&P Dow Jones Indices, rose at a seasonally adjusted annual growth rate of 9.0% in September, faster than an 8.2% increase in August. It was the highest seasonally adjusted annual growth rate since October 2013. Tight inventory of existing homes is contributing to strong house price appreciation. Meanwhile, the Home Price Index, released by the Federal Housing Finance Agency (FHFA), rose at a seasonally adjusted annual rate of 4.2% in September, following the 9.7% increase in August. Figure 2 shows the annual growth rate of home prices for 20 major U.S. metropolitan areas. In September, local home price varied greatly and its annual growth rates ranged from 2.2% to 16.4%. However, all 20 metro areas tracked recorded year-over-year appreciation. Among the 20 metro areas, Atlanta, San Francisco and Tampa had the highest home price appreciation. Atlanta led the way with 16.4%, followed by San Francisco with 14.6% and Tampa with a 12.7% increase. Half of the 20 metro areas exceeded the national average of 9.0%. The ten metro areas that had lower home price appreciation than the national level were: Los Angeles (8.1%), Denver (7.9%), Charlotte (7.4%), Seattle (6.8%), Miami (6.6%), Chicago (6.4%), Portland (6.2%), Detroit (3.9%), Washington, DC (3.7%) and Minneapolis (2.2%). This entry was posted in blog, South Salem and tagged South Salem Luxury Homes on December 16, 2017 by Robert Paul. 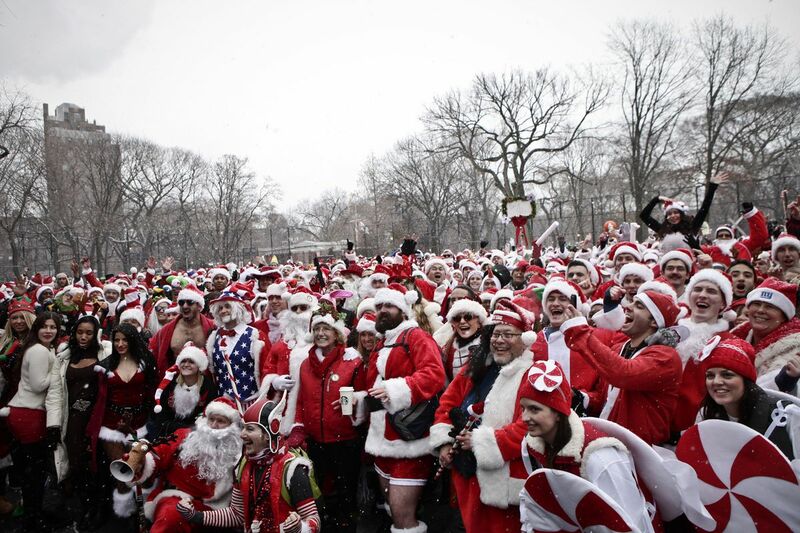 Get ready, New Yorkers: SantaCon is about to flood streets (and bars) of New York once again. If you live under a rock and haven’t seen or heard of SantaCon, it’s that one time of year where flocks of Santa and elf impersonators embark on a festive bar crawl, making a booze-fueled scene through the city that you’ll find either amusing or annoying to watch. It all goes down this Saturday, December 9. Update: The SantaCon organizers have announced the locations for this year’s event, and as predicted, it’ll be concentrated in Manhattan—namely in Midtown and down to the East Village. The festivities will kick off at the James A. Farley Post Office across from Penn Station (of course) at 10 a.m., and things will continue on from there. If you’re looking to participate, we recommend keeping an eye on SantaCon’s official website and Twitterpage for more details. But if you want to avoid the whole thing (and something tells us that if you’re reading this, you do), we have a few tips along with some alternatives that don’t involve being around a swarm of drunken Santas gallivanting around. Stay in the outer boroughs. There’s less of a risk of running into any hordes of Santas in the outer boroughs. Though we do recommend staying away from neighborhoods like Williamsburg and Bushwick, since they’re a little to close to Manhattan for comfort. Avoid going through Midtown if at all possible. Bars on the SantaCon route tend to span much of Midtown, so if you had plans in the area, maybe save it for Sunday. This includes riding the subway through the area. Nowhere is safe from Santas. Get the heck out of town. There are likely to be some bridge-and-tunnel Santas coming in on the LIRR or Metro-North—both of which have imposed alcohol bans on Saturday, along with the New Jersey Transit, who is imposing a ban on all liquid beverages. If you’re going in the opposite direction of Manhattan, you should be safe. Check out local artwork in the Bronx. The Poe Park Visitor Center will be hosting its fifth annual Whimsical Winter Wonder… Exhibition, where you can catch artwork from over a dozen established and upcoming local artists. Head on over to a Winter Wonderland. Enjoy an afternoon filled with crafts, hot chocolate, and a trackless train as part of Winter Wonderland, happening at Brookville Park in Queens. Go dancing on a vintage train. The New York Transit Museum will invite revelers onto the vintage subway cars for a swing-themed dance party. The Nostalgia Swing Train will travel from Second Avenue to the museum’s Downtown Brooklyn location, where the party will continue. Costumes—of the non-Santa, ’40s-inspired variety—are encouraged. Learn how to make a holiday wreath. Have an itch to learn how to make your own holiday wreaths? If so, here is your chance. Horticulturist and landscape designer Wambui Ippolito will be conducting a workshop at Staten Island’s Snug Harbor Cultural Center. Admission is $75 and includes all materials. Embark on an adventure at the Bronx Zoo. If you really want to do something out of the ordinary, make your way to the Bronx Zoo and check out their Treetop Adventure center where you can climb across various obstacle courses and enjoy two zipline adventures. This entry was posted in South Salem and tagged South Salem Luxury Homes on December 8, 2017 by Robert Paul. “We have better light rings than any other products on the market,” says Adam Mittleman. This is a sentence that I have never before heard uttered by anyone, even after a long time living on Planet Earth. But because I am visiting Nest, and Mittleman is its Head of Product Design, working on a new gadget that this startup-turned-controversial Alphabet division is launching, I can’t say I am surprised. After all, light rings—the shimmering glow-circles that allow digital appliances to provide feedback—have been a leitmotif for Nest throughout its eventful journey of disrupting the home. Thermostats, smoke alarms, and now Nest’s new home security system signal users via rings. Nest has given a lot of thought to them. Literally years of thought. Naturally, there is a light ring on the Nest Guard, which is the hub of the Nest Secure suite. That suite has been in the works since well before the company was acquired by Google in January 2014 and then underwent a second recalibration in October 2015 when Google made Nest one of the divisions (“bets”) in the Alphabet archipelago. Depending on the message the new Nest Guard wants to convey, its ring might glow red, yellow or green. Steven Levy is Backchannel’s Editor in Chief. Sign up to get Backchannel’s weekly newsletter, and follow us on Facebook and Twitter. Red, yellow, green. In its brief history, Nest’s own progress might also be charted by a color-shifting light ring signaling the unit’s varying fortunes. Because Alphabet doesn’t break out sales figures or other numbers for Nest, it’s hard to say for sure what those actual fortunes are, but these days a yellow beam might be cutting the company a break. For a long stretch, Nest’s biggest splashes have been product recalls, destructive public infighting, and the departure of its CEO and cofounder. Meanwhile, Nest hasn’t announced a major new product category in ages. Until today. In Nest’s biggest moment in years, it is announcing a series of products that take it onto new ground—and, it hopes, flips its light ring to green for good. The new products include the aforementioned Nest Secure, a home security system; Nest Hello, an internet-connected doorbell; an outdoor version of its Nest Cam IQ security camera (which uses Google face recognition to identify people who wander into range); and, perhaps most significant, the integration of the voice-based Google Assistant into Nest products, beginning with the indoor IQ camera. Nest’s new security system (bottom), video doorbell (left), and outdoor security camera (right). The launch not only brings Nest into new territory, but also sends a signal that despite changes and setbacks, it’s still powered by the same impulse: to transform the home by reinventing mundane home appliances and services with internet connectivity and cutting-edge design. “The DNA hasn’t changed,” says Matt Rogers, who cofounded the company in 2010 with its first CEO, Tony Fadell. “But I think we finally are able to achieve what we’ve always talked about doing. We’re in millions of homes now. We’ve laid this foundation of products that solve really important problems and now we can link them together and do more with them.” Given, of course, that the lights glow green. The face of Nest used to be Fadell, a visionary product designer best known for his iPod work, and a famously exacting leader. (He reportedly tried to cut short his cofounder’s honeymoon so the new bridegroom could address some product crises. Rogers refused.) The new leader would prefer not to be its face. When Fadell left in June 2016, Larry Page replaced him with Marwan Fawaz, a nuts-and-bolts guy who is much in the mold of other recent Alphabet division leaders: experienced, middle-aged guys (always guys) known less for vision than for delivering quarterly results. Though Fawaz is not reticent about invoking his considerable experience, his approach is methodical and straightforward. And decidedly not flamboyant. “They call me No Drama Marwan,” he says. But that message got lost in a series of blunders and corporate shifts. The calamities began soon after the Google acquisition, when the company discovered a serious flaw in its smoke alarm. Its coolest feature, the Nest Wave—the ability to shut down a false alarm by waving your hand—held a potential danger: Under some circumstances it could have kept the alarm silent during a real fire or carbon monoxide release. Though no case like that had ever been reported, Nest halted sales for a few weeks and issued a recall to disable the feature in 440,000 Protect units. During the next few years, news from Nest always seemed to have a bite to it. Users pestered the company with lawsuits about marketing promises and other issues. Rumored products didn’t appear. And everybody wondered just how many gadgets Nest was selling. Alphabet’s silence did not build confidence. In June 2014, Nest bought Dropcam for $555 million, filling a gap in its smart home strategy with the connected camera leader. Though Nest’s painstaking integration of the technology into its system proceeded, however, it failed at combining the two companies’ cultures. Dropcam’s former CEO Greg Duffy, who had joined Nest to head the camera team, became so frustrated—primarily with Fadell—that he reportedly suggested that Page remove Fadell and make himCEO. After Duffy was rebuffed, he took his gripes public in a scathing Medium post. Fadell left Nest in June 2016. Fawaz immediately replaced him. The pileup of calamities might have hurt Nest’s profile among the digerati. But those who remained at the company (though, indeed, some Fadell loyalists have split) say that aside from the personalities of the respective leaders, the culture is still pretty much the same. One positive sign was the return early this year of Nest’s original VP of technology, Yoky Matsuoka, who left the company in 2015 and wound up at Apple. “When I started to look for the place where I can really have the most impact, I was really surprised to see that Nest was on the top of the list,” she says. The real measure of Nest’s success, however, rests on its sales figures. Alphabet keeps those closer than the secrets of its search algorithm—but if you shake the tea leaves just right, you can see signs that Nest has sold pretty well. The fact that it had to recall 440,000 smoke detectors indicates that, even at its high price, the Nest Protect was a hit. Also, Nest products always seem to hold high positions on Amazon’s best seller lists. As I was researching this story, I actually got some concrete evidence: While talking about how he hoped the company would grow in the future, one of Nest’s executives blurted out a number: “Nest is on track to be a billion-dollar run rate company by the end of the year.” And that’s before Nest hits the market with the roster of products it’s launching today. As with most Nest products, the apparent star of the show is a control device that gives users a window into the workings of a tool that was previously buried in analog obscurity. In the case of Nest Secure, that is a sleek tabletop disk—much in the mold of the recent routers from Eero or Google—that replaces the standard (ugly) keypad where customers anxiously tap in their codes before an alarm shrieks. Head of Product for Nest Secure Sophie Le Guen explains the advantages: flexibility in placement (not everybody uses the same door to enter a house); no need to rip open the walls to install wiring; and it looks good. It also provides a number of ways to avoid what Nest discovered was the biggest failing of current systems: false alarms, the majority of which are caused by the same beloved family members (and their pets) that the system is meant to protect. The most important way of defeating those unwelcome, ear-piercing warnings (the Nest Guard is capable of 85db of eardrum misery) is a walnut-sized fob known as the Nest Tag—a $25 personalized pebble that verifies (via near-field communications) someone who’s supposed to be there. If you open a door or window when the system is alarmed, holding the Tag near the Nest Guard prevents the sound blast. “I can give it to my mother-in-law, I can give it to my kid, and they have no stress about how to arm and disarm because you just tag in and tag out,” says Le Guen. Not that you have to give your mother-in-law (or, say, the dogwalker) constant access: Using the Nest App, you can specify limited times and dates that the tag will work. Like memorable character actors crushing in cameos, the real showstoppers of Nest products are often its sensors—and this is especially the case with Nest Secure. Called Nest Detect, the security system’s new $59 sensor performs double duty as a motion detector and a magnet-equipped monitor that detects when a door or window is opened. Another advantage of the Nest Detect is something it doesn’t do: light up when it detects motion. “People don’t want to be reminded that there’s a security device [watching them],” says Le Guen. This entry was posted in South Salem and tagged South Salem Luxury Homes on October 1, 2017 by Robert Paul. Steven Favreau is the type to go big – and go home. 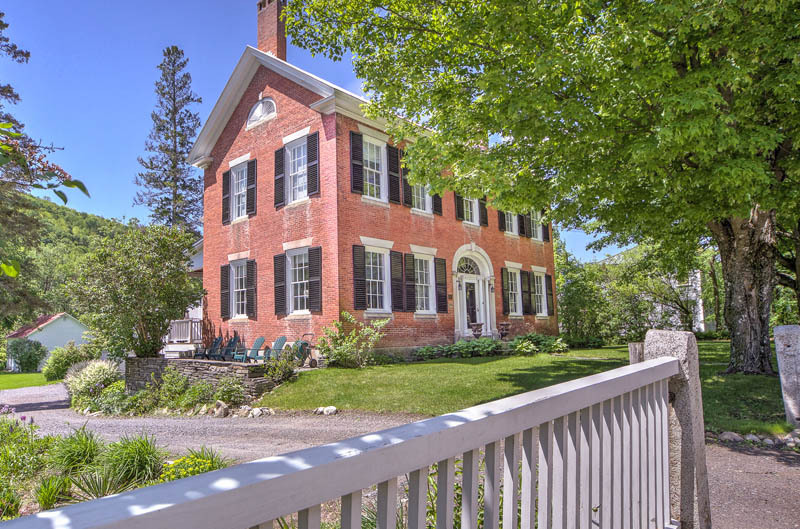 When he set out to put down roots near his hometown of Boston, Favreau fell in love with an old country estate in quaint Chelsea, VT. It was the perfect place for this interior designer to escape from the hubbub of big city life after working with celebrity clients and more. 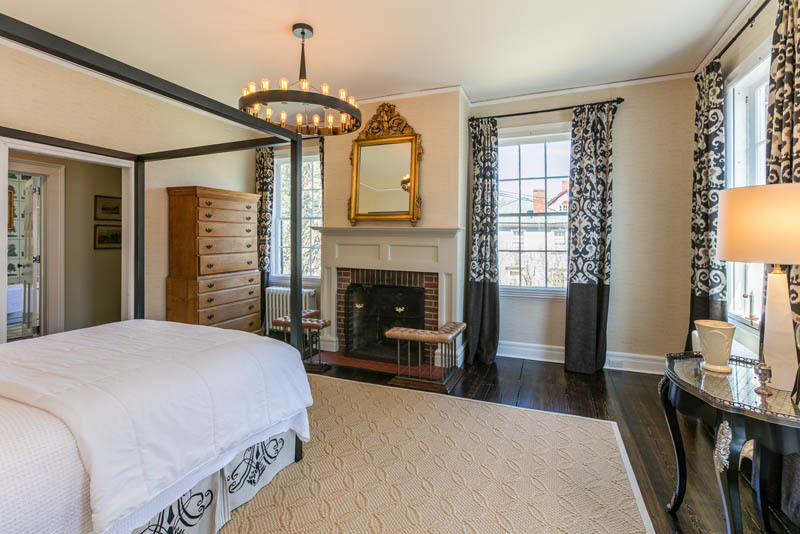 After Favreau purchased the 5-bed, 5-bath home, he sought to restore it to its original grandeur – at a frenetic pace. A contractor brought in a crew to rework everything from the wiring (it was a fire waiting to happen) to the wallpaper (there were 8 layers throughout the house). The workers even put in a massive new beam to support the house and keep it from sinking. 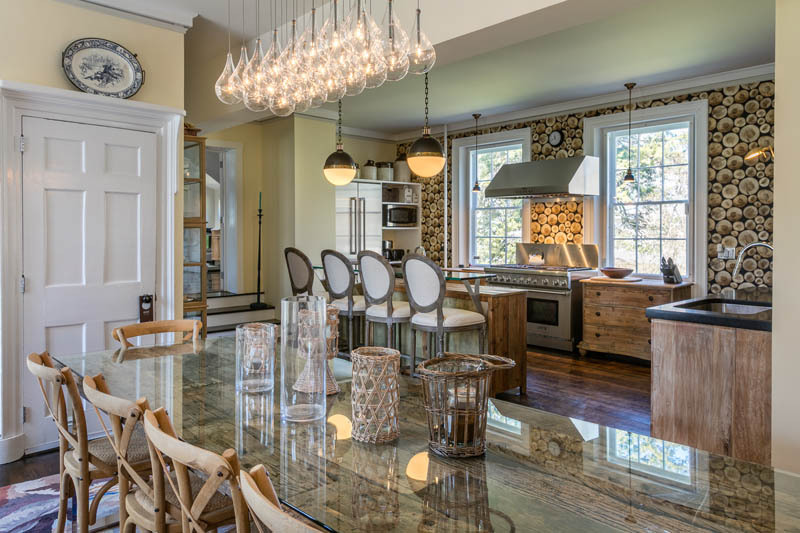 Up next on the designer’s list: keeping the look, feel and integrity of the antique touches, while updating the space to accommodate today’s trends. He tore out a downstairs wall to expand the kitchen to 700 square feet; the master suite got a modern bath with a soaking tub. 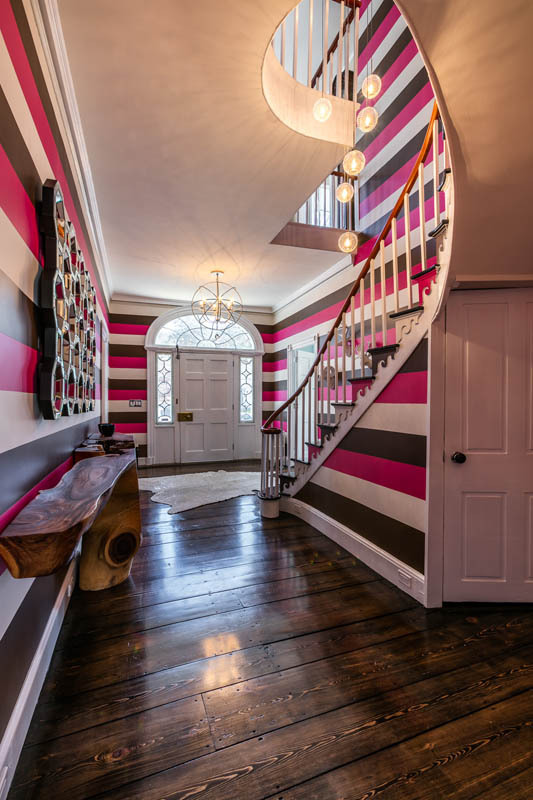 Favreau painted walls in his signature bright colors and added bold wallpaper. 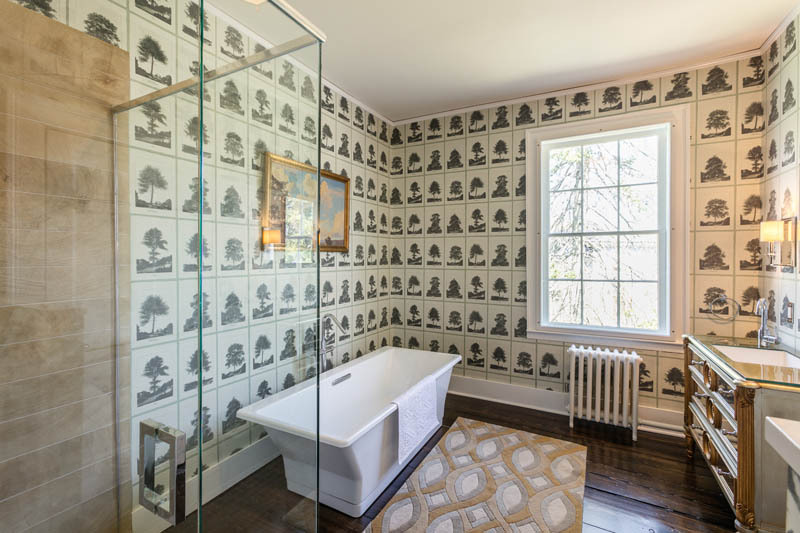 In a tip-of-the-hat to the history of the Green Mountain State, he lined the master bathroom with tree-print wallpaper. 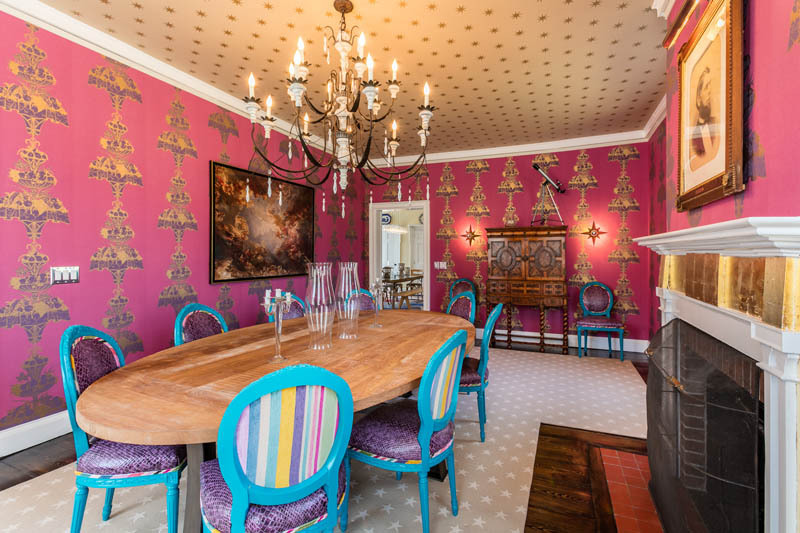 The dining room got a splash of flamingo pink with a print of Victorian-looking cake plates – a nod to the era in which the house was built. Some things are distinctly New England. 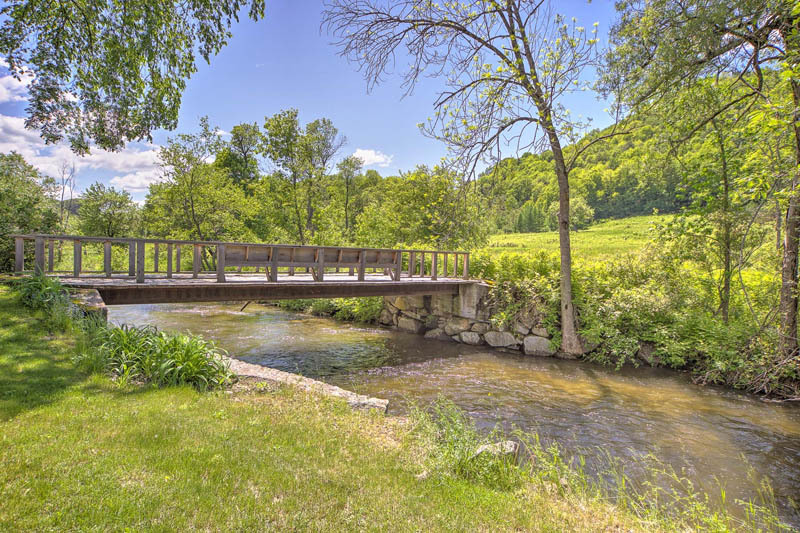 A wooden footbridge connects the main property to 22 secluded acres on the other side of the White River. On warm summer nights, Favreau’s family will pull a dining room table out onto the bridge and dine al fresco. In the winter, the adjacent land allows for snowshoeing or cross-country skiing. 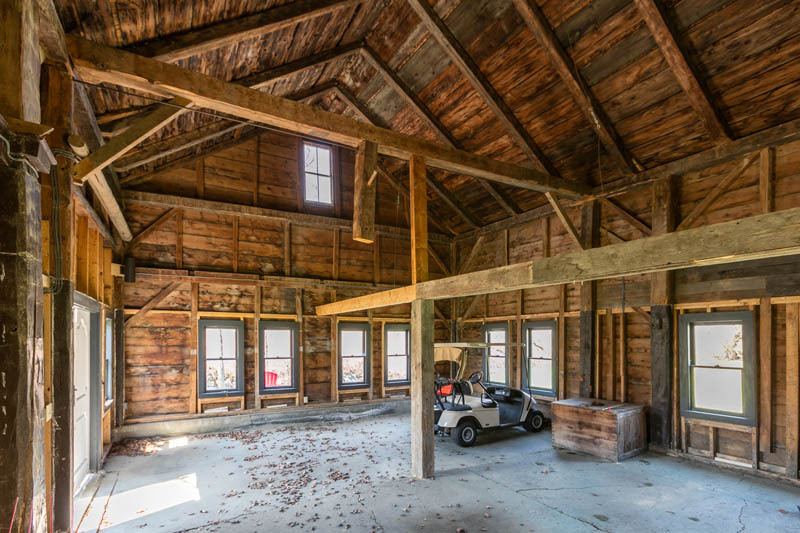 There’s also an old wood barn, which Favreau envisions becoming an event space for weddings or storage. The possibilities for the next owner are limitless, he said. The home is on the market for $695,000. 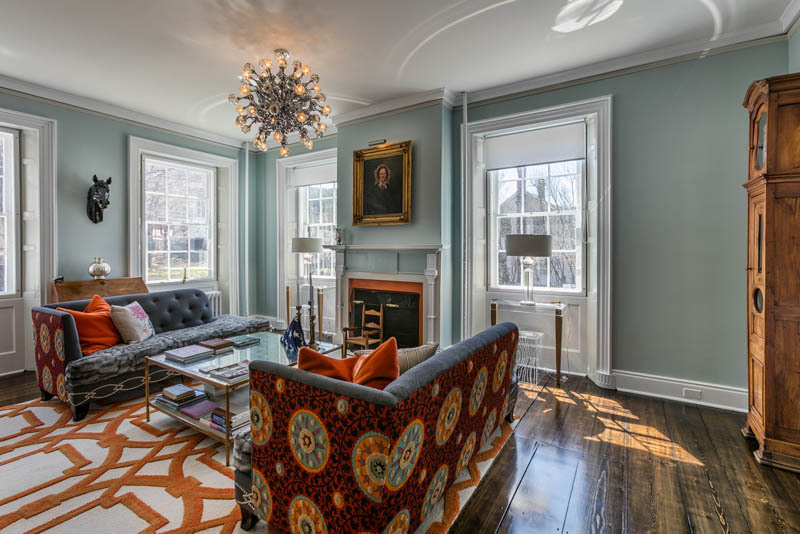 Zoe Hathorn Washburn of Snyder Donegan carries the listing. This entry was posted in blog, South Salem and tagged South Salem Luxury Homes on September 24, 2017 by Robert Paul. The NAHB Housing Market Index in the United States fell to 64 in July of 2017 from a downwardly revised 66 in June, below market expectations of 67. It is the lowest reading in eight months. The index of current single-family home sales went down 2 points to 70; sales expectations over the next six months declined 2 points to 73 and buyer traffic edged down 1 point to 48. Nahb Housing Market Index in the United States averaged 49.44 from 1985 until 2017, reaching an all time high of 78 in December of 1998 and a record low of 8 in January of 2009. This entry was posted in South Salem and tagged South Salem Homes, South Salem Luxury Homes, South Salem NY Homes for Sale on July 19, 2017 by Robert Paul. Construction on new houses fell in May for the third month in a row even though builders are optimistic about the economy, perhaps a sign a shortage of skilled workers is holding the industry back. The pace of so-called housing starts declined by 5.5% to an annual rate of 1.09 million, marking the lowest level in eight months. Economists polled by MarketWatch had forecast housing starts to total 1.23 million. Home builders are now working at a slower pace than they were one year ago. They’ve especially pared back on apartment buildings and other large multi-dwelling units, giving more emphasis to single-family homes. Part of the recent slowdown might reflect a bit of a pause after an unusually warm winter during which builders were much busier than usual. Some economists contend a higher level of construction that occurred earlier in the year would have normally taken place in the spring. Yet builders increasingly complain they cannot find enough good construction workers to get the job done and that could be constricting them. Consider the recent slide in building permits. They fell 4.9% in May to an annual rate of 1.17 million, the lowest level in 13 months. In May, the biggest drop-off occurred in the South and Midwest. Construction rose slightly in the West and was flat in the Northeast. For years the housing market has experienced a mini-renaissance of sorts as a steadily growing economy, rising employment and ultra-low interest rates enabled home people to buy homes. The outlook might not be as favorable now, though. Aside from widespread labor shortages, prices for wood and other raw materials have also risen. And the Federal Reserve has embarked on a series of increases in a key U.S. interest rate that helps determine the cost of borrowing, a potential brake on future sales.. This entry was posted in Lewisboro, South Salem and tagged South Salem Homes for Sale, South Salem Luxury Homes, South Salem NY Homes on June 16, 2017 by Robert Paul. Builder confidence in the market for newly-built single-family homes jumped seven points to a level of 70 on the National Association of Home Builders/Wells Fargo Housing Market Index (HMI). This is the highest reading since July 2005. The increase in market confidence follows the November election results, increasing hopes among home builders and other stakeholders in the residential construction industry that the incoming administration will reduce costly regulatory burdens, particularly for small businesses. Research from NAHB published earlier this year indicated that for home builders, such regulatory costs have risen by more than 29% over the last five years. While the significant increase in builder confidence for December could be considered an outlier, the fact remains that the economic fundamentals continue to look good for housing as we head into 2017. And the rise in the HMI is consistent with recent gains for the stock market and consumer confidence. At the same time, builders remain sensitive to rising mortgage rates and continue to deal with shortages of lots and labor. Derived from a monthly survey that NAHB has been conducting for 30 years, the NAHB/Wells Fargo Housing Market Index gauges builder perceptions of current single-family home sales and sales expectations for the next six months as “good,” “fair” or “poor.” The survey also asks builders to rate traffic of prospective buyers as “high to very high,” “average” or “low to very low.” Scores for each component are then used to calculate a seasonally adjusted index where any number over 50 indicates that more builders view conditions as good than poor. All three HMI components posted healthy gains in December. 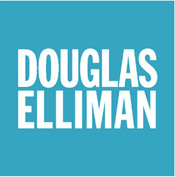 The component gauging current sales conditions increased seven points to 76 while the index charting sales expectations in the next six months jumped nine points to 78. Meanwhile, the component measuring buyer traffic rose six points to 53, marking the first time this gauge has topped 50 since October 2005. This entry was posted in South Salem and tagged South Salem Luxury Homes, South Salem NY Real Estate, South Salem Real Estate for Sale on January 4, 2017 by Robert Paul. Builder confidence in the market for newly-built single-family homes held steady in November at a level of 63 on the National Association of Home Builders/Wells Fargo Housing Market Index (HMI). Builder sentiment has held well above 60 for the past three months, indicating that the single-family housing sector continues to show slow, gradual growth. Ongoing job creation, rising incomes and attractive mortgage rates are supporting demand in the single-family housing sector. These factors will help keep housing on a steady, upward path in the months ahead. It is worth noting that most of the November HMI responses originated before the elections. Thus, builder confidence remained unchanged as the industry awaited the results. The HMI components measuring buyer traffic rose one point to 47, and the index gauging current sales conditions held steady at 69. Meanwhile, the component charting sales expectations in the next six months fell two points to 69. This entry was posted in Lewisboro, South Salem and tagged South Salem Homes, South Salem Luxury Homes, South Salem Real Estate on December 23, 2016 by Robert Paul. Every month, we tell you exactly where the country’s hottest real estate markets are: the regions where insane bidding wars have become the new normal, where people pay $5.5 million for a teardown, and buyers write desperate/sad “Please, please, please, let me buy your house!” letters. With tight inventory throughout the country having pushed up home prices 8% in the past year, we are starting to see more markets acting, well, crazy. But it made us wonder: What about the (polar) opposite? 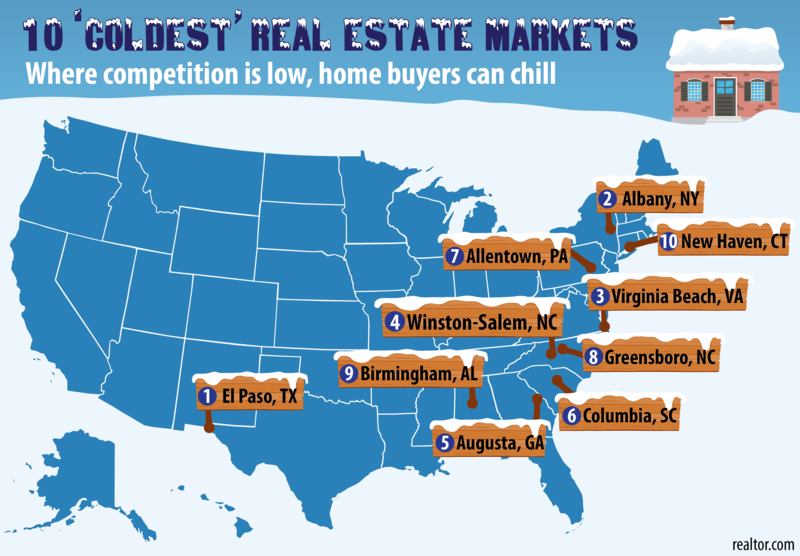 What are the United States’ coldest markets? You know, the ones where there’s plenty of inventory, and shopping for a home doesn’t resemble the final round of the Hunger Games? Of course, plenty of markets see minimal real estate activity because no one actually wants to live there—they’re economically depressed, with few jobs or anything else of note to draw residents. We didn’t want those. Instead, we focused on the nation’s 100 largest metropolitan areas, and identified the top 10 where homes don’t fly off the market at head-spinning speeds, and there isn’t crazy competition from other buyers. And to make certain that these markets aren’t just good bargains, but also good places to live, we filtered out markets where the unemployment rate ranks in the bottom 20% of major U.S. metros. 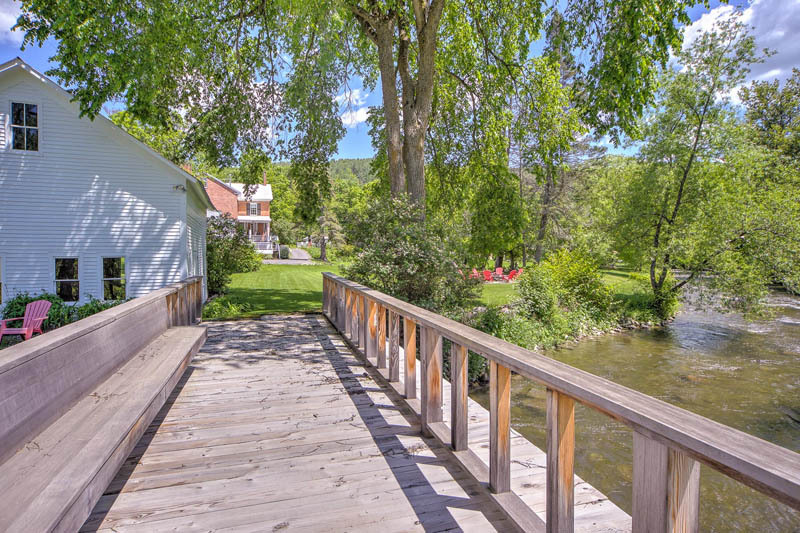 The result is this list of our top 10 overlooked real estate markets in the United States, the places that offer excellent value in less hectic home-buying environments. Bargain hunters, rejoice! Sorry, West Coast: You didn’t make the cut. But each of the following markets have some special attractions for home buyers, including some you probably aren’t aware of. So read on, for the chillest of the chill! Tucked between the U.S. and Mexico, El Paso’s fate is tied to two countries. It’s positioned for tourism and trade opportunities, but the recent strength of the U.S. dollar has discouraged Mexican shoppers, who are spending less. 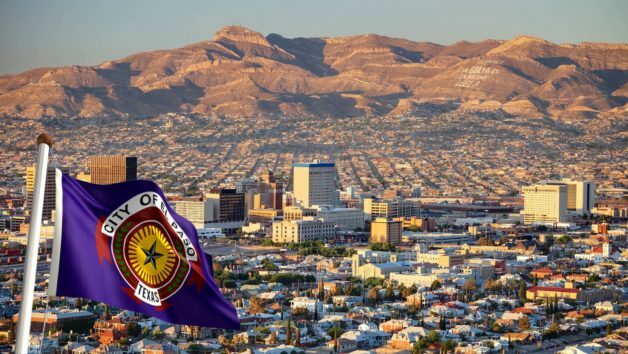 Growth in employment in El Paso was slow after the recession that began in 2008, but the metro area outperformed the rest of the state in 2015, according to the Dallas Federal Reserve. Housing prices are going up, but the market has yet to take off. Bonus: The area’s warm climate and diverse culture makes it an attractive retirement community. Special lures: The cost of living is low, the margaritas are fine (El Paso claims to have invented ’em) and the green chile enchiladas con arroz y frijoles are awesome. Albany’s housing market may offer affordability, but buying a home here can still be a daunting task. Homeowners in Albany County pay a median of $4,166 in property tax, one of the highest in the country. Although it’s the capital of New York state, the number of government jobs has been shrinking since the recession. However, after the city started marketing itself as a tech hub, new corporate sectors have been starting to take hold. Companies like IBM and GlobalFoundries have set up research centers and plants here, and the city is expected to fill 1,180 new jobs in software and Web development through 2020, according to the New York Department of Labor. Special lure: Yeah, it’s freezing. But this place comes to life in the winter, with more sledding, ice skating, snowmobiling, and tubing per capita than just about any metro in the U.S. Invest in long johns. The rolling waves and soft sand not only make Virginia Beach a beautiful place to call home, but also a pretty darn nice place to visit—which is why tourism accounted for $1.4 billion in revenue, and plenty of job growth in 2015, according to the U.S. Travel Association. So how come it shows up as a “cold” market? Well, summer may be gorgeous, but Virginia Beach isn’t quite as appealing in winter. Home sales slow precipitously, from 64 days on the market to 96 days. The city is also vulnerable to hurricanes, most recently Hurricane Matthew. Special lure: Do you consider fishing to be a sport? Then this is the city for you. Strolling the neighborhoods of Winston-Salem, you can’t help notice the quaint historical architecture and tall oaks. It feels as if time has slowed down. So, too, has the pace of home sales. Winston-Salem homes typically take 19 days longer to sell than the national median. But that doesn’t worry the locals.”These communities have long-standing history—we don’t have a huge influx of people moving in, so there’s no quick housing turnaround,” says Samuel Aubrey, CEO of Winston-Salem Regional Association of Realtors®. The upside: The market sees fewer price fluctuations, even during recessionary periods. Special lure: Birthplace of Krispy Kreme donuts. The Masters Golf Tournament enlivens the city once a year, with fans and tourists, but the rest of the year, it’s definitely … quiet. It’s a 9-to-5 city filled with blue-collar jobs manufacturing golf cars, medical supplies, and paperboard. The current unemployment rate of 5.8% is slightly higher than the national average. Still, it has tons of historic charm going for it, and an epic mountain-bike trail system. Special lure: It was the home town of James Brown, the godfather of soul! The second-largest metropolitan area in South Carolina, Columbia is a melting pot of global companies, students and educators, and a strong military presence. BlueCross BlueShield, and the University of South Carolina bolster the economy, with more than 10,000 jobs. Yet one thing that makes home buyers hesitate about Columbia is the crime rate: Violent crime affects 65 in every 1 million people, 73% more than the national average. Some of the safest neighborhoods, however, include Lexington, Blythewood, and Lake Murray. Special lure: This is a place in love with historical preservation. Want to avoid getting punched in this city? Avoid playing Billy Joel’s 1982 song “Allentown” on a jukebox (if you can find it, that is). That ode to the sad decline of this blue-collar town still stings. When Joel sang, “Out in Bethlehem they’re killing time,” he meant nearby Bethlehem Steel, once the nation’s second-largest steel producer, which finally went bankrupt in 2003. But after decades of struggle, Allentown is quietly finding its way along the comeback trail. Although the region’s economy is now a far cry from its heyday, manufacturing jobs are gaining ground, slowly but steadily. The region’s GDP now ranks 73rd out of the 382 largest metropolitan areas in the U.S., up two spots from 2014. Its gains translate into a 5% year-over-year gain in home prices. Special lure: The Lehigh Valley IronPigs are one of the most beloved Triple-A minor league baseball teams in the nation. Go Pigs! Greensboro, like many cities and children, has nicknames—some good, and some not so good. It’s called “GREENsboro” because it’s green and lush; it’s called “GreensBORING” because its downtown is abandoned after 5 p.m., though a major face-lift has given the neighborhood new life. The typical cycle of selling a home is longer than three months, putting the market among the “underachievers.” Local Realtor Jim Wilhoit attributes slow sales to the high-end market, but says the market is healthy overall. Special lure: Greensboro has 33,000 active students, which makes this one of America’s true college towns. Young people are leaving Birmingham: The city’s craft beer scene, growing green spaces, and a roster of talented chefs are not enough to keep the millennials. Between 2011 and 2015, the metro lost 3% of its population between the ages of 25 and 34, while nationally, the age group grew by 6%. The reason? Job scarcity drove many to nearby Nashville and Atlanta, for better employment and higher salaries. Apart from creating new jobs, much of the city’s effort goes into reinventing downtown, with a luxury “rooftop residential” market—namely lofts and high-end condos. Will the real estate market make a comeback? Let’s give it some time. Special lure: Half Moon cookies and gourmet popsicles. This entry was posted in South Salem and tagged South Salem Luxury Homes, South Salem Luxury Real Estate, South Salem Real Estate on December 1, 2016 by Robert Paul. Sales of new single-family houses in the United States declined 1.9 percent to a seasonally adjusted annual rate of 563,000 in October of 2016, compared to market expectations of a 0.3 percent rise. Figures for the previous month were revised down by 19,000 to 574,000. New Home Sales in the United States averaged 651.70 Thousand from 1963 until 2016, reaching an all time high of 1389 Thousand in July of 2005 and a record low of 270 Thousand in February of 2011. New Home Sales in the United States is reported by the U.S. Census Bureau. This entry was posted in South Salem and tagged South Salem Luxury Homes, South Salem NY Realtor, South Salem Real Estate on November 23, 2016 by Robert Paul.